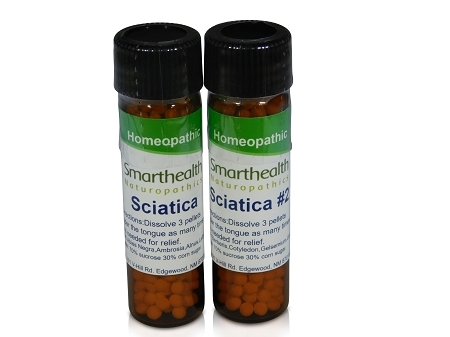 New Sciatica #2 Vial Formula. Sciatic Pain relief. All Natural Homeopathic Oral Pills. May help relieve pain short to long term in the sciatic nerve. If you're new to this product, this is the one to start with our #2 vial formula,once you find the one that works best for you you can come back and buy it separately as the "Original Formula" or "sciatica 2" you'll find them in our inventory. No drug contradiction no adverse reactions 100% all natural. 3 month guarantee. For all age's. You may not need to use OTC'S anymore for relief of sciatica. New improved 2 vial formula.For burning,stitching,numbing pain in the sciatic nerve that runs from the buttocks down the back of the leg to the calf muscle. Regardless of the cause be it inflammation or compression of the sciatic nerve. Take as needed remember you can't take too many of these. There are no adverse negative side effects like with common pharmaceuticals and is non-addictive. This product is made in a FDA supervised laboratory using state of the art manufacturing methods. This product has a success rate of approximately 85% in varying degree's . These statements have not been evaluated by the FDA. This product is not intended to diagnose, treat,cure,or prevent any disease. I made this product for myself and found that during a flare up it relieved just fine only during the worst flare up's did I have to use a couple ibuprofen 200 every 2-3 hours for relief. This is a 2 vial formula if you haven't tried this formula before start with our original formula first, take it for 2-3 days to see if this is the formula for you. If this isn't relieving pain move on to vial # 2 dissolve 3 pellets under the tongue as many times daily as needed for pain relief. I you have tried our original formula already and you are happy with it you will find it in our inventory listed as the "Original Formula. Vial 1 Active ingredients:Abies Negra,Ambrosia,Alnus, Lathyrus,Kalmia Lat,Iberis. Active ingredients of vial 2 Berberis,Cotyledon,Gelsemium,Guarea. Inactive ingredients of both vials: 70% sucrose 30% corn sugar in non allergenic pellets. Directions: Start with vial #1 dissolve 3-4 pellets under the tongue every 3 hours or as needed for pain relief. If this vial is not relieving pain after 3 days of use try using vial #2 do the same dissolve 3-4 pellets under the tongue as many time daily as needed for pain.Once you know what vial works best for you you can buy it separately and save some money. Carpal Tunnel, Writer"s Cramp, Elbow Tendonitis & Bursitis. "The Worlds best Headache Formula" Recurring Headache. Oral Homepathic Pills.